For those with long memories, or an interest in the history of Australian big boat racing, the Sayonara Cup will be a familiar trophy, if only in reputation. In many ways it can be said that in its time, the Sayonara Cup was Australia’s equivalent of the America’s Cup. It had been described as such as early as 1904, and indeed many contend that it was the Sayonara Cup contests that tested Australian sailors’ mettle for big yacht racing. The yacht that started the whole thing more than a hundred years ago, and indeed gave its name to the trophy, has recently been relaunched after extensive rebuilding and restoration. The Sayonara was built as a fast cruising yawl in 1897 for the then commodore of the Royal Yacht Club of Victoria, George Garrard. He commissioned master boat builder Alex McFarlane of Birkenhead, Adelaide, for the job, and had his new yacht built to a design of Scottish naval architect William Fife jnr, a design made as a sister ship to Fife’s own Cirego. Reputedly the highest standards were maintained in all Sayonara’s particulars. 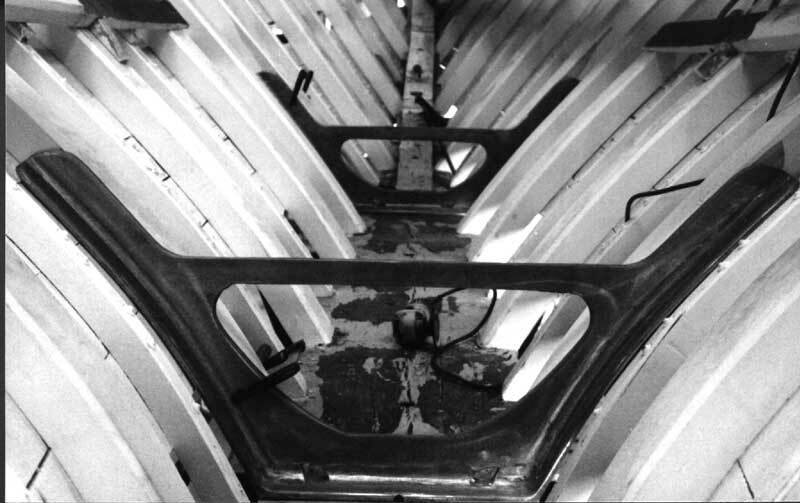 One story has it that Sayonara was the first boat in Australia to have lightweight hollow spars, built in America. She also carried a new and extensive suit of English sails, made by Ratsey & Lapthorne. Her dimensions were 58 feet long on deck, LWL of 38 feet with a beam of 10′ 6″. After launching in November of the same year, Sayonara was sailed around to her owner in Melbourne. The yacht soon proved to be unbeatable on Port Phillip, but changed hands in July 1898, and under her new ownership had her racing rig changed to a cutter, increasing her sail area by about 300 square feet. By 1903 Sayonara had been sold to Alfred Gollin (see accompanying story ‘The Cup’). 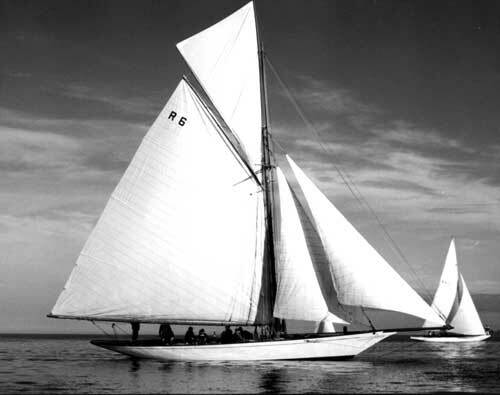 Sayonara was originally built as a cruising yawl, and it was usual for her owners to put the mizzen mast back in for some of the year, when racing was off, and go cruising. 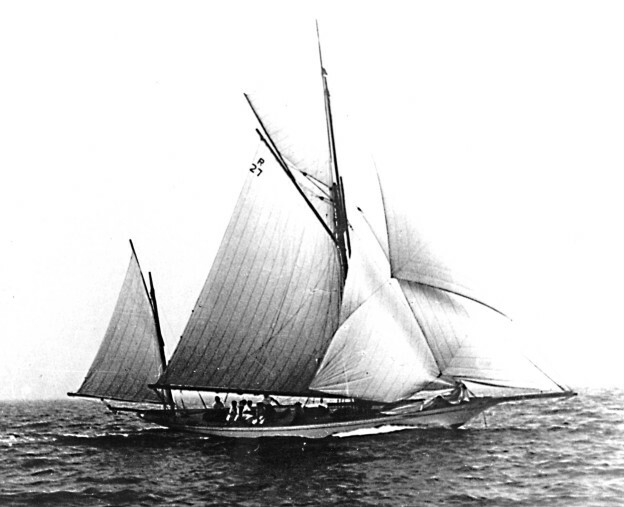 The yacht was sold to a Sydney owner in 1912, and spent the rest of her life there under different owners until being bought recently by a Melbourne syndicate headed by Col Anderson of Hood Sails fame. The syndicate ended up with eight members, but it was Col Anderson and Doug Shields that started the ball rolling. Anastasia Constantinidis and David Golding of D&A Traditional Boat Restorations were appointed to take on the huge job of stripping Sayonara back to basics and restoring her. Both David and Anastasia had previously worked on the restorations of Waitangi (built in 1894 in New Zealand to a Robert Logan design) and Acrospire (built by Hayes & Son to a Charlie Peel design in 1923 in Sydney – as a challenger, by the way, to the Sayonara Cup). Anastasia had been a rigger on the Enterprize and had worked on the rigging of the new Endeavour in Fremantle. Michael Hurrell and Shannon Dummett were put on to lighten the work load, as well as various people along the way as need dictated. 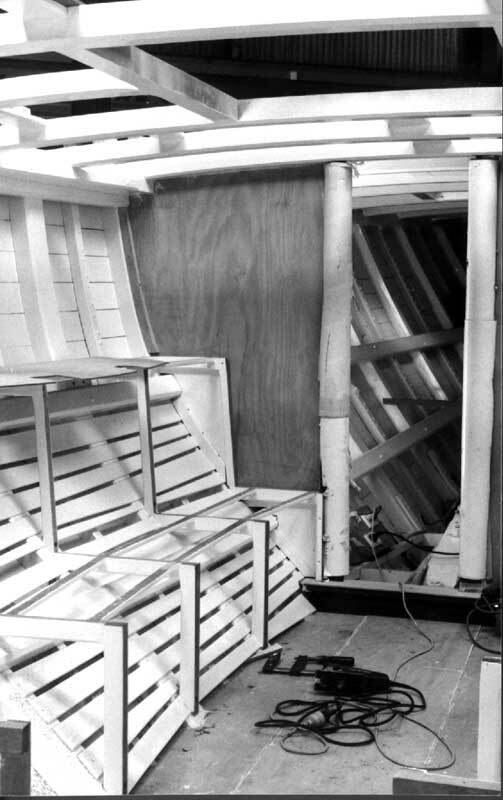 “One of the first things was to rip all the deck off,” David says, “put some temporary supports across (to keep the hull shape), and gradually replaced all the sawn frames.” These were replaced with laminated frames of Tasmanian Celery Top, made up to five inches by three inches. “There would have been about eight layers of 10mm each. And as we were doing that we replaced all the ribs too. So she has all new framing now,” David says. 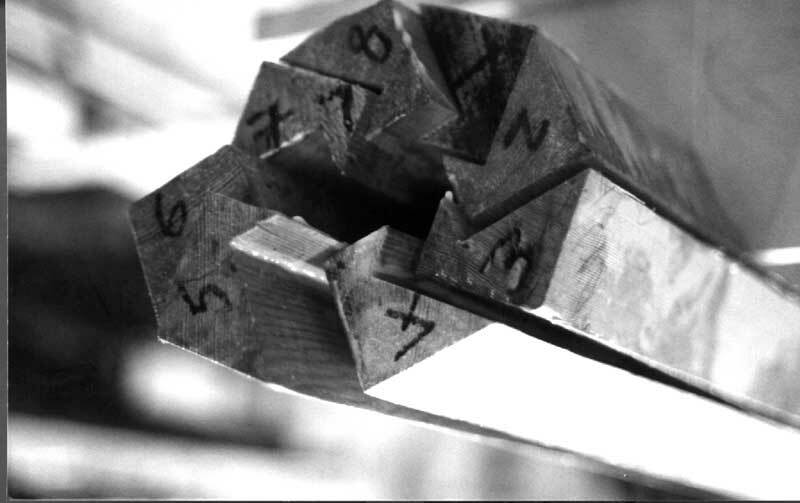 New spars and masts were made, fashioned as hollow pieces, epoxied together in “birdmouth” sections, which fit together neatly (see photograph). This method allows for greater surfaces presented for gluing as well as locking together to provide more strength and rigidity. Charles Constantinidis (Anastasia’s father) made these. The topmast is fidded, so it can be lowered when necessary. “The syndicate at first didn’t want this,” says Anastasia, “and opted for it just to be fixed permanently in place. We just wouldn’t have that, and argued for the fidded topmast, which is what the boat ended up with” – an option that should prove sensible, in comfort and safety terms, in extreme weather conditions. The planking replacements are of Huon Pine, and they were able to get full length planks to do it. The garboards are 10 inches by one and a half inches. “It’s inch and a quarter planking all over, but the garboards are wider, and of course they’ve got quite a bit of shape to them as well,” says David. The keelson was not replaced, but they had to take it off to be able to clean or replace the floors. Once the new bronze floors were in, the keelson was reinstalled. A sponsorship deal of sorts was struck with Volvo Penta whereby a new engine and all relevant parts were supplied in exchange for Volvo being able to showcase its product through Sayonara. A spanking new 78 HP Volvo Penta TMD22 engine was installed by JJ Marinecraft of South Melbourne, with all necessary controls, accessories and hardware, and a three blade folding propellor. All the coamings are Honduras Mahogany, as is the skylight, main hatch, the forward hatch and the rail capping. The frames were continued up to construct the bulwark around the frame ends, the bulwark plank being Huon as well. “All the fittings had to be custom made, and we made our own patterns for them and sent these off to a foundry,” says David. And as the yacht came to the restorers with the 1930s Bermudan rig, the bronze fittings for the gaff rig spars and all relevant hardware had to be made from scratch. The owners had sourced copies of the original plans, as the boat was registered with Lloyds of London. Indeed the Lloyds identification number, ON 101730, was still carved into the deck beam just forward of the mast, along with its original tonnage. From the plans, they had an accurate picture of what the deck layout was like – the coachroof, coamings and hatches. “We had some old photos as well,” says David, “which were a help.” The rigging too is as the original – galvanised, spliced and parcelled. In the end, the only components that come from the original boat are the external planking and the keel timbers. “We had to make a new rudder, mainly from the fact that there is a propellor to consider now. The rudder can now be taken off horizontally, and doesn’t have to slide down vertically into place. All the bronze pieces for this arrangement had to be cast especially. It’s a bit unusual, but it works,” David says. The syndicate bought Sayonara from Hank Kossen in Sydney. Hank bought the yacht from a fellow named Udo Handel in 1979, and his stated intention was “to do her up and go sailing”. And that’s exactly what Hank did. Hank believes that when he got her, Sayonara was pretty much in her original set up, apart from the sail plan, which had been changed to Bermudan. 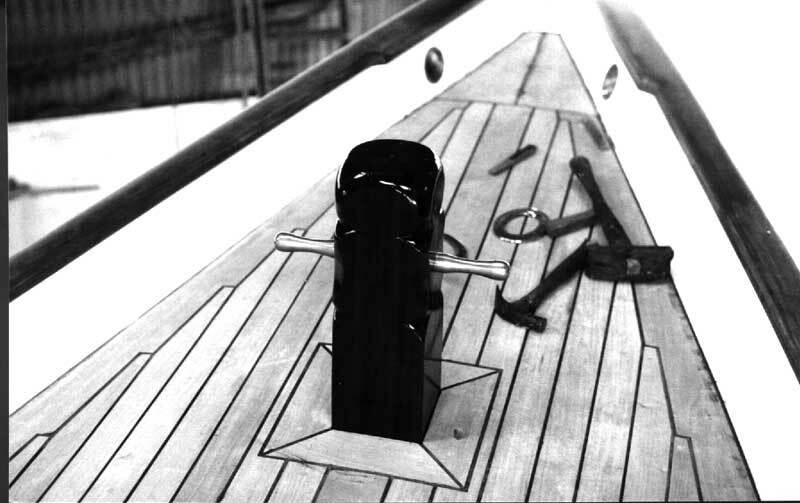 The mizzen mast step was still inside, but Hank took off the mizzen chain plates. The boat was raised, says Col Anderson, “in a pretty sorry state”. It was not long after that Hank bought Sayonara from Udo. And it was fast too. “I made some very quick passages. Once we did 80 miles in six hours, which is about 13 knots. And it was good in light airs, which is very important. But with a lot of distance under her keel, Sayonara was eventually in need of some major work. “By that time I had gone many many miles in her. I wore out the rigging, I wore out the sails,” says Hank. “I had chipped out all the cement that had been poured into the bilge. I think Joe Griffin did that, but he would never admit to it. 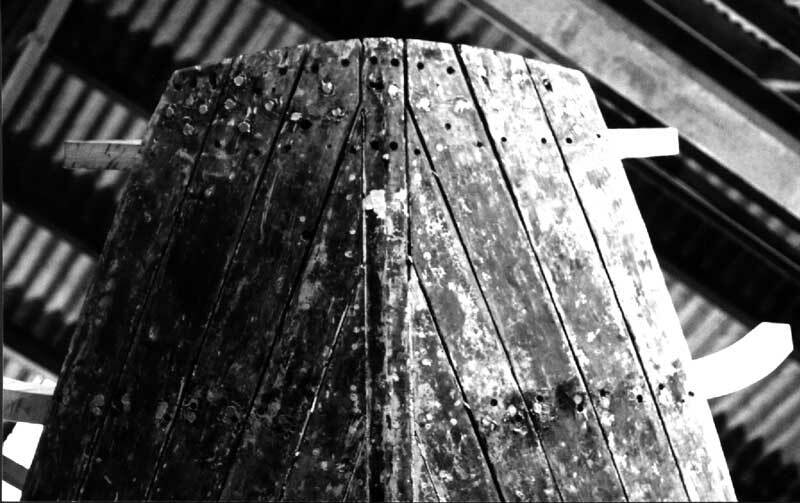 But when I got it out I could see why it had been put there in the first place – to stiffen up the weak floors.” Interestingly, David and Anastasia say that when they got to the bilge, they found that it had been filled to a depth of about four inches with epoxy resin. “Lots of screws were put into the garboard, left with their heads sticking out. I guess to give the epoxy something to grip to,” says David. He and Anastasia chipped out the lot, bit by bit, and theorise that it was put in for the same reason as the concrete that Hank encountered – to hold the weakened lot together. Hank had obviously chosen a similar solution, but with a modern material. At the time, however, Hank had to seriously consider what had to be done. “I thought a patch up job just wasn’t what she deserved. And with what she needed, it was a huge job,” he says. And he was right. D&A Traditional Boat Restorations found out exactly what had taken place over the years, and it was indeed a massive and costly job. But the result, after all the effort, the time, planning, expense and hard work, is a superlative example of a classic Fife yacht. Carved panels – original features – adorn each side of the main saloon, with sea serpents swimming in intricate scrolled waves surrounding a life buoy with the ship’s name and RYCV etched into it. One was washed up on shore after Sayonara sunk that time in Lavender Bay, and was found and kept by a Sydney local for many years. Col Anderson tracked him down and eventually persuaded him (by means unknown) to relinquish the panel. Credit must be paid to Sayonara’s new owners for putting so much in to get this classic Australian yacht back into as-new condition, and to the restorers for their skill and dedication while on the job. No detail has been left unattended in Sayonara’s restoration. As well as ensuring the salvation and future of an Australian yachting icon, the survival of Sayonara has been assured for at least the next 100 years. Sayonara was coverted back to her cruising yawl rig and sailed to Sydney for the race. Her racing cutter spars and sails went up by steamer. The race was held in Sydney Harbour in January 1904, with Sayonara winning two of the three races and taking the prize. Gollin presented the now-named Sayonara Cup as a perpetual trophy for interstate challenges. Interestingly, the deed of gift stipulated that the yachts must sail to the races on their own bottoms. Right up until 1962, the Sayonara Cup was the hotly contested premier interstate racing trophy for big yachts. In the same year, Australia made its first challenge for the America’s Cup. Our sailors, it seems, had cut their big boat racing teeth, and were ready to take on the world.